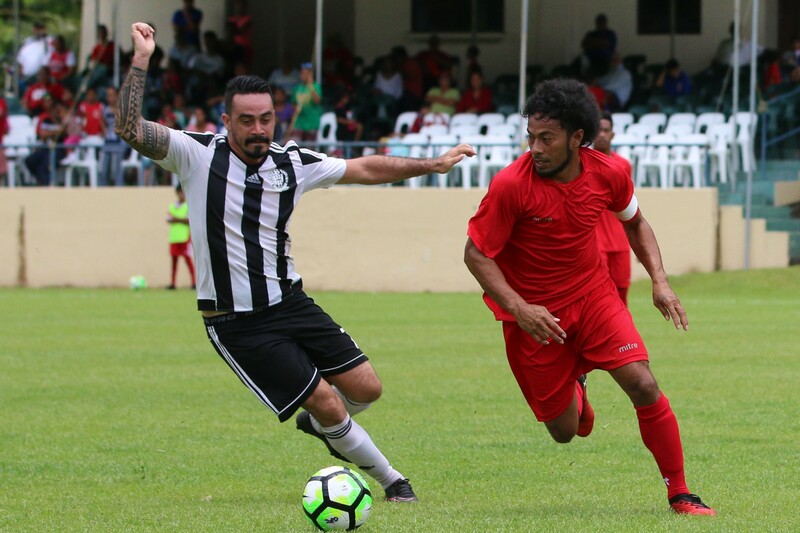 Tupapa Maraerenga will make their first appearance in the OFC Champions League group stage since 2001 after defeating Veitongo 9-2 while Lupe Ole Soaga got their campaign back on track with a 13-1 win over Pago Youth. The Cook Islands club changed that record today when they beat Veitongo with a tidy display of structured, attacking football. Just 12 minutes in and Tupapa were setting the tone when Sean Latimer found the back of the net and a second wasn’t too far behind. For a brief moment it seemed like things were about to change when Hone Fowler was deemed to have fouled Soakai Vea in the box, earning a penalty for Veitongo. 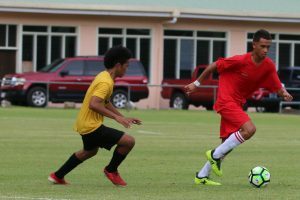 However the young striker lost his cool and was shown red and although Vai Lutu netted from the spot, it was always going to be tough for the Tongans to stay in contention with almost an hour of football remaining in the match. Although Veitongo were able to hold off their opponents for a while, two quick-fire goals in additional time from Maro Bonsu-Maro and Hone Fowler meant they were staring down a 4-1 deficit coming into the second half. 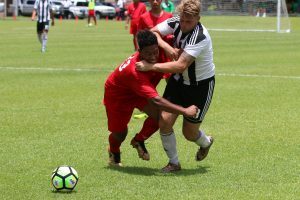 The goals kept flowing for Tupapa with Grover Harmon getting on the board while Latimer and Bonsu Maro both secured a hat-trick and Fowler’s last taking Tupapa Maraerenga to nine goals, and securing him a brace. Lutu pulled back once more from the spot in the third minute of additional time but having also lost captain Sione Uhatahi to a red card it was barely a consolation prize for the disappointed Tongan contingent. After an improved performance and dominance across the park, coach Alex Napa was pleased Tupapa secured such a resounding victory. ‘’Two wins is good to have in the bag, one more game to go and we hope that we can put a decent team in for the last game and make a good job of it at the last hurdle,’’ Napa said. Veitongo coach Timote Moleni struggled to contain his disappointment but said one positive could be how the team played through the last 16 minutes despite having just nine players on the field. The day’s second encounter brought neighbourly rivalry to the field as home side Pago Youth welcomed Lupe Ole Soaga of Samoa. After narrowly losing their opening match Lupe Ole Soaga were determined to improve both their on-field performance, and their discipline, for match two. 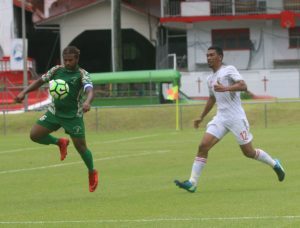 Although Pago had a couple of tantalising breaks in the opening few minutes, the match really was Lupe’s for the taking as striker Lapalapa Toni took just nine minutes to put his side on the scoresheet. Roy Ledoux’s goal in the 30th minute was a break in the onslaught for Pago, but with Lupe notching a further five first-half goals it looked like another high-scoring encounter was on the cards for fans. Suivai Ataga proved the team’s most prolific scorer adding two goals after the break to his first half hat-trick while Faafua Ataga Laloata’s brace and goals to Samuelu Malo, Ken Kerewi and Michael Fifi’i taking the tally to 13. The result is the biggest margin to date in the Qualifier, with Pago Youth’s 11-1 loss to Tupapa Maraerenga on 17 October 2013. Coach Paul Ualesi was overjoyed to win their second match and believed the win was well-deserved after another whole-hearted, but well-structured, performance from his team. ‘’First of all I’m so proud of my boys for the hard work, they tried to execute our game plan well for this second game and it was good for them to work on their discipline as well and you can see we tried to press on them the importance of working on their discipline and controlling their mental aspect of the game as well,” Ualesi said. He said a big score was one of their objectives for today’s match. The big loss was not what Pago Youth coach Li’atama Amisone Jnr. had been expecting when his side ran out onto the field this afternoon. However he admitted the team’s weaknesses proved too big to overcome on the day. “We did not keep our composure and stick to the game plan,” he said.